Today was my last day of the Beachbody Ultimate Reset. Another day where I felt great. Had a softball game at night where I’m definitely not up to speed yet but I am feeling great. Breakfast was the usual plate of fresh fruit. For lunch we had a Carrot Seaweed Medley and Microgreen Salad. 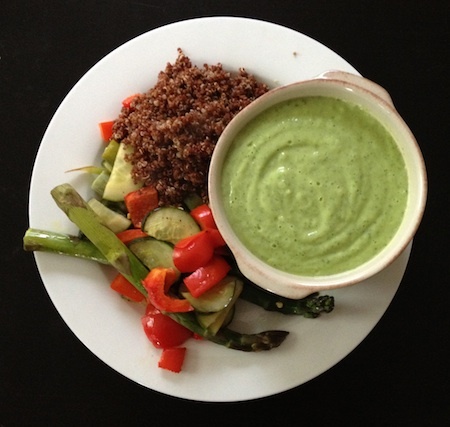 Dinner was Avocado-Cucumber Soup, Roasted Veggies, and Quinoa. The soup is awesome. I recommend checking out my full review of the Ultimate Reset where I share before and after photos, how much weight I lost, and thoughts about the entire program. I was mainly curious on what it would do for me. I didn’t think I could make it 21 days without working out but I ended up needing it. Its been a long time since I gave my body a extended rest. You could lose the 15 pounds in 21 days with the reset alone or by doing Insanity and following the meal plan.